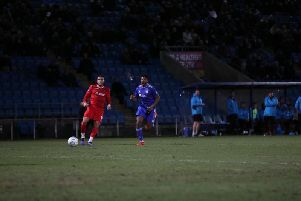 Steve Saunders scores Town's second goal against West Brom. Picture courtesy of Johnny Meynell. Halifax supporters have been given precious few golden moments to savour over the years. But one of The Shaymen’s most memorable days ever should serve as inspiration to the current crop ahead of their FA Cup second round clash at home to League One AFC Wimbledon on Saturday. Elfyn Edwards beats West Brom's Bob Taylor to a header. Picture courtesy of Johhny Meynell. Tom Scargill talks to some of those involved when Halifax upset the odds and knocked West Brom out of the cup in 1993. Halifax Town 2 West Bromwich Albion 1, FA Cup First Round, 13 November 1993. The ripples of Town’s traumatic first ever relegation from the Football League were still being felt when The Shaymen overcame West Brom in-front of the Sky cameras. The Baggies were three divisions higher than Town, but had only won five of their 19 games in all competitions before turning up at The Shay. Sky Sports clearly sensed an upset, screening the tie live, and Town didn’t disappoint, providing an unexpectedly joyous postscript to their relegation six months previously. “We deserved to win that game, there’s no two ways about it,” says David German, then a 20-year-old defender. “There was something aligned, and what we did went well, and they hit the bar, hit the post, had it cleared off the line. “It goes like that sometimes. That’s football. Steve Saunders celebrates his goal against West Brom. Picture courtesy of Johnny Meynell. “We didn’t have anything to lose. “We’d been relegated, then Pete (Wragg) took over, and I think the board and the fans were expecting us to just be beating everybody in sight, and it wasn’t the case. “But the game came at a good time. “We were in transition, we’d lost Chris Lucketti, who was a good player and went on to do well. “The three centre halves that day - Billy Barr, Craig Boardman and Elfin Edwards - and the two wing-backs, I’m pretty sure all of us blocked something that day. “But the three centre-backs and Darren (Heyes) in goal were brilliant. “We were under the kosh for a lot of that game, certainly second-half. It just seemed like we were knocking it in the corner and they were coming straight back at us. “They had Kieran O’Regan, Bob Taylor, they were no dummies at all, they had quality the whole way through the team. “I’d only just signed for Halifax,” recalls Craig Boardman, then a 23-year-old centre-back. “I think I’d played in one game for them against Bromsgrove, and then it was West Brom. “I barely knew the lads. I’d trained with them a few times. “I knew we were underdogs. Their striker Bob Taylor was banging goals in for fun, so we knew he’d be a threat. “It was a big game for us,” says defender Billy Barr, who rates the win as his finest in a Town shirt. “We had quite a few chances in the first-half. “We ended up going 2-0 up, and then I didn’t think we were as good in the second-half but we defended well. “I think they scored with about 10 minutes to go but we hung on for what was a famous victory, and we celebrated in style that night. “We all went out together in town, with half the town congratulating us! “We were up for it,” recalls Boardman. “Everyone was looking forward to it, being on Sky. “I’m sure at the back of our minds we knew the odds were against us, but you’ve just got to go for it. “It was very exciting. The FA Cup’s one of the best competitions in the world because you see time and time again, these smaller clubs doing well against the big clubs. “If you ask any of the lads that day, they’ll have all played against teams where they think it’ll be easy, and if you go in with that mentality, you struggle. “There was a decent crowd there, they (West Brom) had a real top-class side out,” says then Town boss Peter Wragg. “But we kept breaking on them. I remember Peakey scoring his goal. “Obviously they’d come out of the league, when I first went there I didn’t know how many players we had, we were taking a few chances with some of the players. “We just tried to be busy and not go on silly runs. “Our team was full of unsung, really good players,” says German. “Colin Lambert, what a good player he was, did a good job for Halifax. “I played with Dave Ridings at Leigh, really good player, really unfortunate with injury. “Jamie Paterson, tremendous player who got better and better, and hit his peak when he was part of that Conference winning side, and good on him. “It was a real team effort. There were no real world beaters, we had some good players, but we had to graft, and that day, goodness me did we graft. “Every single one of us on that day, we put a shift in, and it paid dividends. Halifax Town: Heyes, German, Craven, Edwards, Boardman, Barr, Peake, Lambert, Paterson (Constable 85 mins), Saunders. West Bromwich Albion: Lange, Coldicott, Ampadu (Reid 77), McNally, O’Regan, Burgess, Hunt, Hamilton, Taylor, Ashcroft, Donovan (Mellon 61).